Sonoma County Growers Achieve Record Harvest! Crush District 3, Sonoma and Marin Counties, harvested 60.7% more tons in 2012 than in 2011, which is 42% above the 5-year average yield levels. Average prices increased 4.9% (Table 6) resulting in gross grape revenues of $582,443,442, a 68.5% increase over 2011! The $101/ton average price increase does not reflect bulk wine production. The average price was $2182/T (Table 6). The significantly above average yields coupled with an average price increase of 4.9% provided needed increases in grower revenues of over $236.8 million after two difficult years in 2010 and 2011. The price increase for Table 10 prices which represent independent grower sales was 4.2%. This increase resulted from stronger spot market prices in the spring, with some pullback in price for excess tonnage through harvest. There were new buyers and those who were in the market increased price offerings throughout the growing season. Overall, 2012 had strong market demand. Pinot Noir was the leading red variety for revenues in 2012, eclipsing Chardonnay by by $5.1 million. Early grape demand in 2013 has been encouraging but buyers may delay decisions as they digest the 2012 Grape Crush Report results. The market is near balance even with the large 2012 crop. The keys for 2013 grape demand will be wine sales volume and the ability to raise wine prices to regain margins that have shrunk due to higher winery costs, including grape prices. Bulk wine production will be reported in the Final Grape Crush Report. Bulk Wine buyers from other states and California regions can search the online Grape Marketplace for bulk wine to purchase at https://sonomawinegrape.org/grape-marketplace/bulk-wine-for-sale. If you have grapes or bulk wine for sale, those should be listed on the Grape Marketplace. 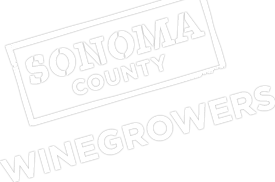 Commission advertisements in vineyard and winery trade magazines promote Sonoma County grapes and growers, along with these online listings to grape buyers and winemakers. Growers need to update their information regularly, including removing any listings if contracts have been signed. Growers and grape buyers need to take advantage of the Grape Marketplace tool.